Sometimes, a traditional hot water heater is overkill. 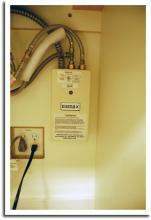 If you need near instantaneous hot water, an electric tankless water heater may fit the bill. Works great in a small office kitchen or bathroom setting, unless you provide shower facilities. However, once you install several of them, they can cost as much as a traditional water heater. The advantage is that if you ever need to replace the tankless water heater, you don’t need a couple of plumbers to remove and haul away the heavy metal beast. Tankless water heaters are compact and convenient.